See Sam Rockwell Deal With Space Madness in "Moon"
These stills from Sam Rockwell's new movie Moon bring some serious cold shudders. We've been eagerly following the development of Duncan Jones' creepy space tale about an isolated astronaut with rage issues stationed at a remote moon for three years. It's about space madness - and what happens when giant corporations abuse science.Bloody Disgusting got a bunch of new clips for Moon and it's looking seriously tripped out and cold in an eerie fantastic way, so it's just about perfect that Sam Rockwell is attached to the project. Kevin Spacey lends his voice to the computer. 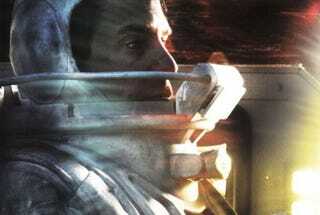 Rockwell plays Sam the raging isolated space miner who comes face to face with his personal demons as his three-year rotation on a far-away moon is winding down. Check out more pics at Bloody Disgusting.